Everyone Has Stopped Dreaming For You! You have this gift that annoys everyone else, in fact, THEY see this your gift as their problem. This gift is being yourself every single day. Its a problem to some people, because they can never be like you! Ever! And it hurts them so much! At first, they’d think you’re either crazy or stupid or both because you’re being yourself and/or following your dreams. The dreams you had alone, the future you’ve believed, held alone before its manifestation, the things you’ve loved alone… Your first piece of crap about to be turned cash. So once you start making something out of your natural self, they become your enemies overnight. Secondly, you become their problem. Then, they blame you for being the an idiot or adamant… maybe because you failed… Again. If I was you, I’d ignore them, go out and try again. In the end, You’re the one to be blamed, for the way you lived your life, whether you listen to people or not. These people… Who are they? THEY are me, your parents, family and everyone else that don’t have your exact eyes, DNA and passion. They could make you doubt yourself, feel dangerous! 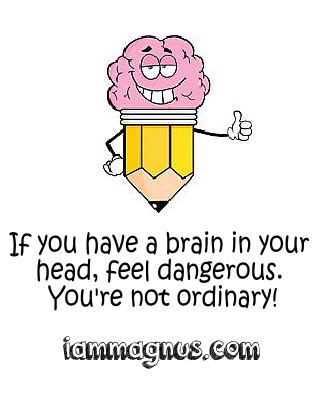 If you have a brain in your head, feel dangerous! 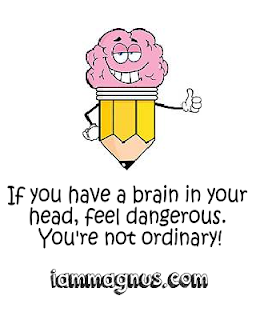 You’re not ordinary!